Cleanness is a tough task for you. Everyday you clean your house and everyday dust will be there. Air pollution is increasing day by day. Indoor Air pollution is hampering our health and basically, children are more affected by this. You should know the exact reason and sources of air pollutant even should know the remedy. In older days most of the households use a basic cleaning device to clean the house on daily basis. A garden, verandah, balcony, courtyard space also available in every house to have a better interface with the fresh environment. The most house had a high ceiling, ventilators, window, door, the cleanness is very important for all these tools. In older days, people spent most of their time outdoors for his work and other activities. Now, you spend more time indoors. That may be your home or office. On average, you see that you are spending 90% of the time indoors. You breathe the unpolluted stagnant air for a long period of time and effect of pollution like eye irritation, runny nose, throat irritation, headaches, dizziness etc. 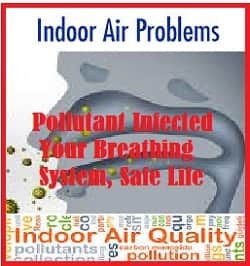 Do you know indoor air pollution is more harmful than outdoor air pollution? It is very difficult to eradicate all the pollution from your home. But you can try to reduce it in a large scale. Now you will know about the exact sources of these pollutants. How they affect your health and what is the remedy?. The exact sources of indoor pollution. The main sources of pollution are bio-aerosols, building material, combustion etc. The incomplete combustion of biomass fuels releases particulates, carbon, monoxide etc. 1. Building Materials - This is a great source of pollution. If you have demolished any part of your house, the dust will be very harmful to you. The household product like Air Fresheners release pollution continuously. 2. Walls - Paint fumes in freshly painted walls also release indoor pollution. The chemical used in that is the mixture of some harmful essence. That inhale by the nose during breathing. The inhale content hamper the breathing system of your body. Paints and building product release formaldehyde, benzene, and another volatile organic compound. That is injurious to your health. 3. Carpets And Rugs- Generally you spread carpet to hide the dust of the floor. The carpet and rugs make them look decent. But the other problem creates there. Carpet and Rugs trap dust mites, pet dander's, cockroach allergens, mold, particulates. The slight disturbance like walking makes the pollutants airborne. 4. Kitchen - This is also a big source of bacteria, insects, and pollution. The cockroaches, dangerous gases release during cooking. The pact area of the kitchen is also born new insects and small kit. These mix up with food during cooking and hamper your health. 5. Furnishings - Furnishings of furniture trap bacteria, virus, fungi dust mites, pet danders etc. The paint polishes and varnishes of the furniture prepare from chemical and these are very much harmful to you. The smell of chemical inhale through your nose and affect lugs. The accumulation and continuous inhaling will be affected by your digestion system and create dizziness. Besides these, unclean and UN-ventilated toilets, household chemicals like aerosol spray product, air fresheners, detergents also content dangerous chemical, this help to start the headaches, vomiting, eyes irritation etc. Some paints contain methyl chloride and that is the cause of cancer too. The best remedy of air pollutant is to clean your house on daily basis. Always keep clean the closest and hidden part of your house. Follow the safety points, when you are using the paint for house renovation. Keep wrap up your mouth and nose from soft cloth to reduce the impact on breathing. Use the vacuum cleaner to clean the carpet and rugs. Use the precautionary measures during wall painting. The Indoor Air Pollutant and Sources will be unaffected your health if follow the instruction as given above.